Because of my younger sister, Sarah, who has Down syndrome, the focus of my practice is helping families with special needs develop strategies so that their children or loved ones can live impactful and purposeful lives. I believe that everyone has the ability to be impactful in the lives of others and it is this ability that gives each of us a strong sense of purpose in life. I am unique in my approach to Special Needs Planning. My uniqueness is due to the abilities that I see in my sister and the many ways she has been able to impact the lives of others. The planning process for individuals with special needs is often misunderstood, even by many professionals. Setting up a Special Needs Trust by a reputable attorney to ensure that your child’s assets do not them from government benefits is important. Developing a strategy for how to fund your Special Needs Trust is also important. However, if this is as far as we go with our planning conversations, we, as professionals, have missed our opportunity to truly be impactful in the lives of the families we serve. In my opinion, that’s just the tip of the iceberg when it comes to what Special Needs Planning should truly should entail. The purpose of planning for an individual with special needs is to ensure that he or she is able to live a dignified and impactful life. What makes a life meaningful is unique to each and every individual. Vision Planning: Your Vision Plan describes what a great life for your child looks like. This includes your hopes and dreams for their life, as well as, their own hopes and dreams for their future. Your Vision Plan guides every other step of your Comprehensive Special Needs Planning process. Life Planning: Your Life Plan documents important details about your family and your child, describes your child’s daily routines, serves as a bench-marking tool to show annual progress, and functions as a transition guide in the future. Resource Planning: Your Resource Plan determines the services, organizations, and individuals who can assist with fulfilling the hopes and dreams of your loved one’s Vision Plan and meet the current needs assessed by their Life Plan. Financial Planning: Your Financial Plan provides strategies to pay for the services your Resource Plan determined are necessary to achieve the goals of your loved one’s Vision and Life Plans. It also addresses the challenge of how to provide financially for your child when you are no longer able to do so. Legal Planning: Your Legal Plan controls, protects, and transfers your assets according to your wishes (during your lifetime and after your death) so that your child has access to the resources necessary to live a great life. It also ensures that the Comprehensive Special Needs Plan that you have created continues to be fulfilled, even when you are no longer able to make decisions. The FIVE areas of Special Needs Planning can seem overwhelming, frustrating, and confusing at times. These feelings often stall families’ planning process, resulting in no plan being created. 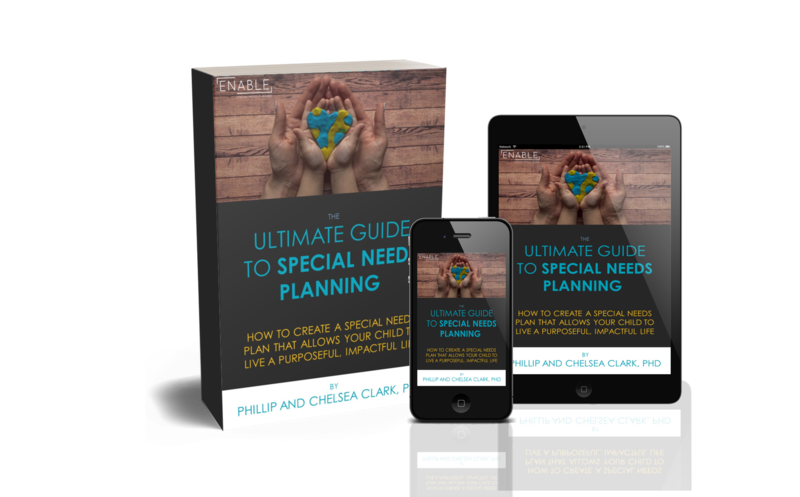 A Special Needs Planning professional will be equipped to ask the right questions and provide the right guidance to make the planning process easier, more efficient, and ultimately more impactful to your family and your loved one with special needs. He or she will be able to provide valuable and needed resources to help you achieve peace of mind from knowing that you are well planned. Over the next five days, I will provide additional details about each of the FIVE areas of Comprehensive Special Needs Planning, including why each element is vital. On Day 7 of my series 7 Days To A Comprehensive Special Needs Plan For Your Loved One I will provide you with a quick and easy self-assessment tool that will help you evaluate how well planned you and your family are for the future. Day 2: What’s Your Vision of a Great Life for Your Child? Day 3: If You Won a Weekend Getaway, would You be Prepared to Leave Your Child with a Family Member? Day 4: Does Your Child have Access to All the Resources They Need to Thrive? How Would You Know? Day 5: Does Your Financial Plan Account for the Abundant Hopes and Dreams You Have for Your Child? Day 7: Take the Quiz: How Well Planned Are You? Don’t miss out on this valuable information. Be sure to stop back by my website (www.enablesnp.com/blog) or Facebook page (@ENABLEsnp), every day this week, around 2pm ET, when I will post the next segment of this planning series! Next postVision Planning: What’s Your Vision of a Great Life for Your Child?